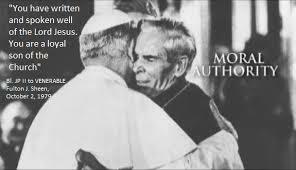 When I was studying philosophy early in my seminary formation, I remember reflecting on the words of a great philosophy professor, the Venerable Fulton Sheen: “we never win converts by a didactic presentation of syllogisms”. Since I struggled with my philosophy course in logic, this eased my mind a little bit. What Archbishop Sheen is communicating is that even though education and good communication are essential, we are never going to call people to Life in Christ with eloquent and convincing argumentation and logic alone. We convince people by witness, by the dedicated lives we live. Sheen, the Great Communicator who was so eloquent, poetic, charismatic, charming may have opened the hearts and minds of people with his beautiful expressions and apologetic arguments, but what helped so many was his personal witness of life, his humble admission of his own challenges and weaknesses, but his serious commitment to being a true and humble servant of Jesus Christ. Archbishop Sheen died when I was only 8 years old, and long before I was a Catholic but his life and witness, even his personal admission of some of his struggles with pride among other things deepen my own commitment as a Catholic. His book “A Priest is Not His Own”, which very beautifully expresses the theological and earthly expression of the identity of priesthood is an important book to me in helping to understand what a priest is meant to be. But it’s just words unless I live it, and it would only have been words if I didn’t have means to know Archbishop Sheen truly sought to live by these words himself. Our Gospel today offers us yet more parables, ways and means of understanding our faith and seeking to live it in deeper and more meaningful ways. As we seek to give witness to Christ in our own particular and unique way, I pray that we find the words that express our own vocation in ways we can comprehend and understand, but I also pray that we find living proof by others fine examples of how to put these words to action in the lives we live. May God bless you. Next A Few For the Harvest: The Lord Needs You!! !